Regarded as a ‘Lucky Plant’, Jade Plants are easy to grow both indoors and outdoors, and they are readily available for sale online, the question is which species. They are all succulents and all grow well in containers, outdoors in the right conditions and are also used as bonsai specimens. Crassula Ovata is known as the Giant Jade Plant and perhaps the best known, often referred to as the ‘True Jade Plant’. 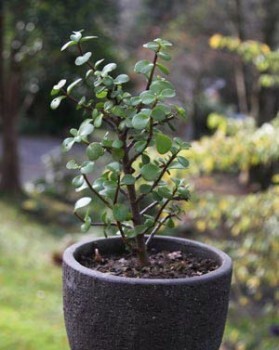 However Portulacaria afra is commonly referred to as ‘The Dwarf Jade Plant’. Portulacaria afra ‘Variegated’ is a nice variegated form. The true jade plant can get to be a large specimen over time, up to 2m in height with a large stem. However the stems do break easily and this is why they are usually much smaller. In the natural habitat you will find that pieces that break off will take root, so large clumps form over time. This also means they are easy to propagate from cuttings. Jade Plants are a succulent plant require very little care and once established are reasonably drought tolerant. Often grown in pots or containers Jade plants do require protection from frosts. Plants can be pruned back to maintain shape as required. And while you are pruning try growing them from cuttings, they do strike fairly easily. In warm humid conditions these plants can suffer from rot if over watered, so good drainage is essential. Foliage will become tinged with red if the plant is stressed, so this can mean excessive heat, cold, over watering or extreme dryness. Extreme cold is a problem, and plants will need to be indoors in these conditions. How to Flower a Jade plant. Jade plants will flower, you will need to patient, and provide the right conditions. Here are four tips that will encourage your Jade plant to flower. Generally they need to be around 5 – 8 years old to flower. As the weather cools, reduce the watering, and move the plant to a cool frost free position.